The Prime Minister, Shri Narendra Modi and the Prime Minister of Italy, Mr. Giuseppe Conte at the valedictory session of the India-Italy Technology Summit, in New Delhi on October 30, 2018. The Union Minister for Science & Technology, Earth Sciences and Environment, Forest & Climate Change, Dr. Harsh Vardhan and other dignitaries are also seen. 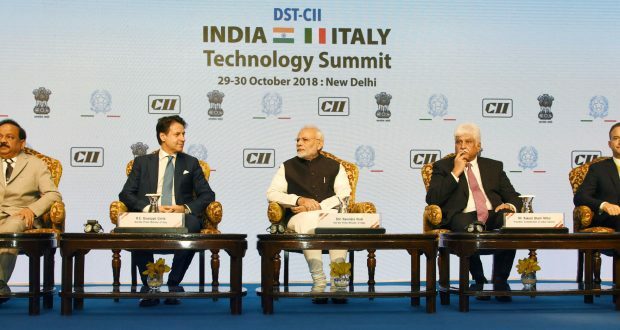 Newdelhi:30/10/18:The Prime Minister, Shri Narendra Modi, today, addressed the India-Italy Technology Summit at New Delhi. The Prime Minister of Italy,Mr. Giuseppe Conte, was also present on the occasion. During the address, Prime Minister announced the launch of the next phase of the India-Italy Industrial Research and Development Cooperation program. He added that the program will enable our industry and research institutes to develop new products. Talking about the importance of technology, Prime Minister said that India has made technology a medium forattaining social justice, empowerment, inclusionand transparency. He added that the government is using technology to ensure effective last mile delivery of services. Prime Minister said that the government is emphasising on developing technological temperament along with scientific temperament among the citizens. In this context, Shri Modi mentioned about Atal Innovation Mission, Umang App and three lakh Common Service Centres spread across the country. He said that these technological solutions haveensured that government is brought to the doorsteps of the citizens. Highlighting the Indian Space Program, Prime Minister said that it is an example of innovation with quality. He added that India is now able to send space satellites of many countries including Italy’s and that it showcases India’s capability of creating innovative solutions at low cost. Prime Minister also expressed happiness in the enhanced cooperation between India and Italy in the field of Life Style Accessories Design (LAD). He added that special focus will be given forLeather sector and Transportation & Automobile Design (TAD).